In this memoir, Emmy Award-winning filmmaker Lee Stanley shares his inspiring quest to create and produce documentaries starring, and helping, juvenile delinquents. Battling the courts and prison officials, he persistently worked the system until the first project was approved and produced. The Desperate Passage won him an Emmy. Stanley tells his story in a blunt, honest fashion, allowing the reader to see the dichotomy of an impatient, often angry, and driven man who yet continued to follow what he believed was God’s plan for him. 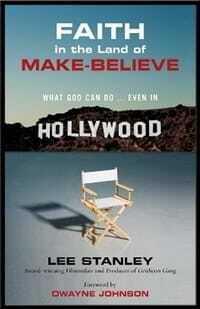 He resisted attempts by production companies and donors to change the tone, theme, and message of his films, believing that he must remain faithful to the original vision God had given him. Ultimately he won over many skeptics on his way to winning five Emmys for his documentary series featuring under-aged criminals put into unique teambuilding circumstances that challenged and motivated them. One of those documentaries was made into a movie in 2006: Gridiron Gang, starring Dwayne Johnson (aka “The Rock”) became a #1 box office hit. In it, a group of juvenile prisoners—among the most violent of street criminals—are taught the game of football so they can compete against “straight schools” and learn the value of teamwork and commitment. Johnson provides a heartfelt forward, endorsing not only the book but Stanley’s life-long dedication to at-risk youth. Faith in the Land of Make-Believe does not merely lay out the process by which Stanley accomplished his goals. He gets personal, discussing his divorces, his children, his emotional and spiritual struggles. His 3rd wife, Linda, played a major role in both his eventual stability as a family man and the success of his filmmaking dreams. His pursuit of those dreams took its toll on their marriage, and on their kids. Time and again his proposals would be shot down, his family’s finances would spiral into debt, and his dreams would seem farther off than ever. That they were eventually realized made him a more grateful, humbler pers on. Stanley’s account provides the average reader (who probably likes movies) with an inside look at Hollywood politics, what it takes to move a film from an idea in your head all the way to the screen. The amount of money involved is staggering. The obstacles he faced as a Christian promoting Christian ideals and themes are not surprising. The writing is choppy at times. As scenes moved from present to past and back to present, I often had to go back over the transitions several times in order to follow the story accurately. Stanley doesn’t claim to be a writer—he’s just telling his story, and the sometimes rough quality of the prose reflects that reality.